With over 10 years of teaching experience, Katlyn is a devoted and enthusiastic teacher to students of all ages. 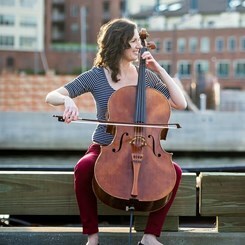 An active performer, she holds the position of Associate Principal Cellist with the Maryland Symphony Orchestra, and appears frequently with the Annapolis, Richmond, and Charleston Symphonies. Katlyn is a graduate of the Eastman School of Music where she earned her Masters degree, and the Peabody Conservatory of Music where she earned her Bachelors degree. Request Lessons with Katlyn today!